No matter what type of water softener, reverse osmosis or other water filtration needs you have, H2O Care can install and maintain a system with solutions for your specific water quality issues. The water filtration systems above represent just some of the solutions typically employed to address various water quality concerns. These water softener & filtration solutions can handle the majority of water contaminants found in the water supplying homes in New England. The tested level of minerals or contaminants found in the water, along with estimated volume usage will determine the best approach. 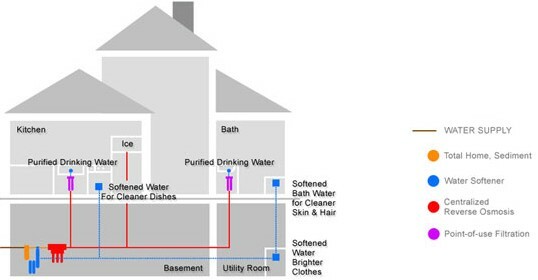 Water quality can vary greatly from house to house, depending on which aquifiers your well is drawing water from. Water testing results of the well across the street can be very different than your own private well’s results. Also, the ground water sources supplying your well may change in terms of quantity and quality of water supplied over time. For this reason, routine maintenance of your system should always include water testing to make sure your water softener or filtration system is continuing to create the water quality levels desired. As can be seen in the water hardness scale above, small quantities of certain minerals (in this case magnesium & calcium, the hardness minerals) can have a large impact on water quality. 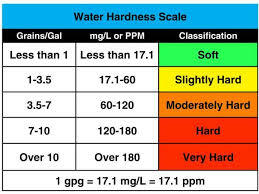 For a more complete coverage of hard water, see the link at: https://water.usgs.gov/edu/hardness.html. It should be noted that often times water tests will reveal multiple contaminants which need to be addressed. A complete solution may dictate multiple pieces of equipment to eliminate the problems and create the desired water quality. Your water treatment professional will review this with you to explain the reason for any particular piece of equipment recommended for installation. Any recommendation is backed by our guarantee.